During a solar eclipse, time becomes compressed. The few moments the moon takes to edge its way between the sun and earth disturb the normal cycle of day and night, under certain circumstances even throwing a person´s spatiotemporal orientation over the edge. At least so say some of the impassioned eclipse chasers heard off-screen, pursued by Lukas Marxt and Vanja Smiljanic on the Faroe Islands. Marxt and Smiljanic organized material they and others recorded during a solar eclipse in March 2015, to create a small catalogue of cosmic visual data. Eclipse chasers and collectors are seen readying themselves and positioning their optical instruments; an outer-space weather fairy analyses recent solar storms; an early warning radar station waits for signals from on high, while a thick fog makes it impossible to see ahead. Esotericism is the subject, not the method. For example, Marxt and Smiljanic replace the familiar spectacle of the gliding corona with the shimmering lightshow of a local guitar band, their vision mixes amazement with ironic playfulness. In the end, a second band performs on a picturesque cliff with a view to the sun; the solar eclipse is recorded in one single shot. It is a directorial gesture of consummate insight and immersion; the film treats its impressive posturing with subtle irony. Namely by this point we have already been deeply submerged in the Shadowland of the film´s title, the spatiotemporal zone of a total eclipse. The artificial light of camera flashes and searching spotlights penetrates the darkness here in what seems like a touching parody of the missing sunlight. When bright light rescues fragments of the landscape from complete darkness, it is as if mankind is attempting to reassure itself that the world still exists. 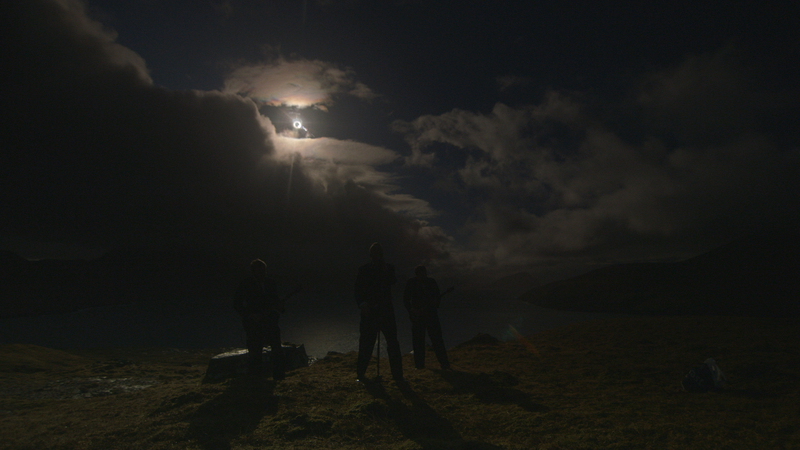 Shadowland explores an impact of a Total eclipse of the Sun on the community of eclipse chasers in Faroe Islands. By appropriating the term „shadowland“, a spatiotemporal space when Sun is fully eclipsed, the film depicts the variety of rituals people perform in order to engage with this cosmic event of monumental proportions. In the film Shadowland, the Sun eclipse is contextualised as a symbolic crisis of human existence, and is seen as a liminal space.